In Middle School we aim to set in motion a love of learning that lasts a lifetime. When you walk around the Belmont Hill campus, you will see students learning and having fun together, working with teachers who are involved in every aspect of their lives. Classes are small, generally averaging 12 students. Using the Harkness style of teaching, our boys are challenged to be active and engaged learners from the moment they step foot on campus. They also routinely practice public speaking. Our lab-experiment-based curriculum, combined with the inclusion of Smartboard technology, have reinvigorated the study of mathematics and science. Belmont Hill's rigorous standard and well-honed teaching styles produce impressive results, particularly in terms of standardized testing and college placement. In fact, Belmont Hill students averaged a 4.2 on AP exams. 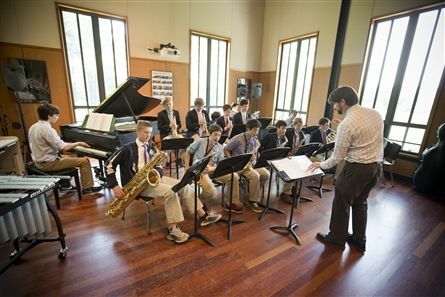 Interdisciplinary in nature, Belmont Hill’s newly reconstructed Middle School curriculum focuses on grade-level themes that unite the forms with a central question that is most applicable to their stage of development. In grade 7, Form I, boys study heroes and ask the questions of who are heroes and why? In grade 8 they ask: What does it mean to be a boy and what does it mean to be a man? With books like To Kill a Mockingbird, Lord of the Flies, and The Outsiders as their guide, boys encounter different conceptions of masculinity. In grade 9 our boys study leadership. 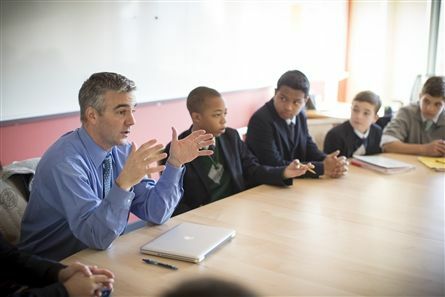 All boys are required to take a formal Ethics course, taught by Head of School, Greg Schneider, and a Leadership course. As a national leader in boys' education, we pride ourselves in knowing boys: how they develop, think, and learn. We have constructed a learning environment where middle and high school boys can be successful. Belmont Hill is a founding member of the International Boys' School Coalition (IBSC), a group dedicated to the education and development of boys worldwide. Previous Head of School, Rick Melvoin, is a founding board member of the IBSC, and past Executive Director, Chris Wadsworth, is the former Head of Belmont Hill. We also have the great fortune to have nationally renowned boys' psychologist Michael Thompson as our consulting clinical psychologist. Belmont Hill boys are active in all areas of school life and are afforded the opportunity to develop into multi-dimensional young men. Participation in the arts, athletics and music is required in the Middle School, and all boys have the option of trying out for any of the three Middle School theatrical productions. With 29 middle school teams representing 16 different interscholastic sports, all boys, whether they be a novice or an experienced player, have the chance to play. The schedule is designed so that boys can play a sport, have a role in the play, sing in the glee club, play a musical instrument and take an arts course all at the same time! We offer extensive vocal and instrumental programs, with a Middle School Glee Club and instrumental ensembles featuring rock, jazz and chamber music. Private music lessons are available as well. Unlike most schools, Belmont Hill purposefully integrates the 9th grade into the Middle School where opportunities for leadership abound. We instill in students the skills necessary for effective and responsible leadership where they enjoy a challenging and nurturing experience that extends beyond the self. As editors of the Middle School newspaper, leaders of our Middle School community service group, or simply proctors at sit down lunch, they learn and practice leadership on a daily basis. Our boys enter the Upper School in 10th grade as empowered young men feeling academically and socially prepared to take on any challenges. Teaching character is an intentional and formal part of our curriculum. Honesty, integrity, respect for oneself and for others, courage, compassion… these values lie at the core of the Belmont Hill experience. Students learn character from their teachers, who also serve as advisors, coaches, and role models. 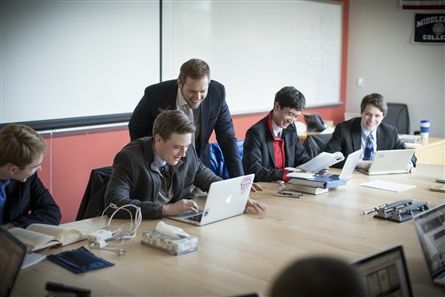 In Form III, every student takes an ethics course with Head of School, Greg Schneider. When you tour our campus, there is a palpable feeling of warmth, humor, and energy. Our boys look happy because they genuinely enjoy being a student here. We work hard but we also take great pride in having balanced students who look forward to coming to school every day. There are many annual events that highlight the Middle School experience. Some, you will experience in your first year, others as you advance. 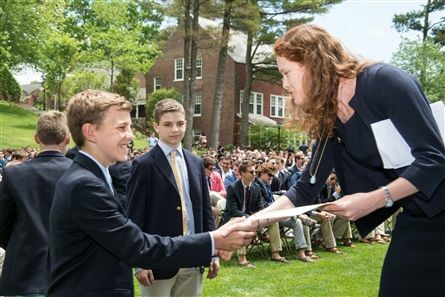 Learn more about the special moments that comprise the Middle School experience.